The staff and members of the CSPAAA more than one year ago vowed to find this association a home. A place where we could honor the deeds and memories of the Connecticut State Police, its members both sworn and civilian along with its great accomplishments. That dream came true when we signed a ten year lease on a building located in the Mulcahy Complex in Meriden, the building is adjacent to the Forensic Laboratory. We are currently refurbishing this building and making it ready to receive the thousands of artifacts that have been collected. Another promise that the Alumni Board made was to define just how we would support and defend the Connecticut State Police Department in any way we possibly could. 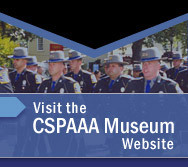 Some of the methods we have chosen to accomplish this goal have been; Assisting in the operation of the State Police booth at the Eastern States Exposition, Operate or display vintage State Police vehicles at funerals, wakes and parades, donate monies to purchase items in support of State Police Department functions or displays, begin the creation of a peer support program which will be the first of its kind within the United States. Our organization are utilizing monies collected from dues and donations to build this museum and educational center, while still providing support to our members. We have recently accepted many great donations of materials and money from various individuals and corporate sponsors, we can most certainly use more help. Please consider us when you donate. As the trustees of your memories and this great departments history; we shall keep the name of this department, the names of our membership, past and present, especially those who have fallen in the line of duty very much alive. Those memories must be preserved in a special place. They will be, very soon at Building #7, Mulcahy Complex, Colony Street in Meriden.